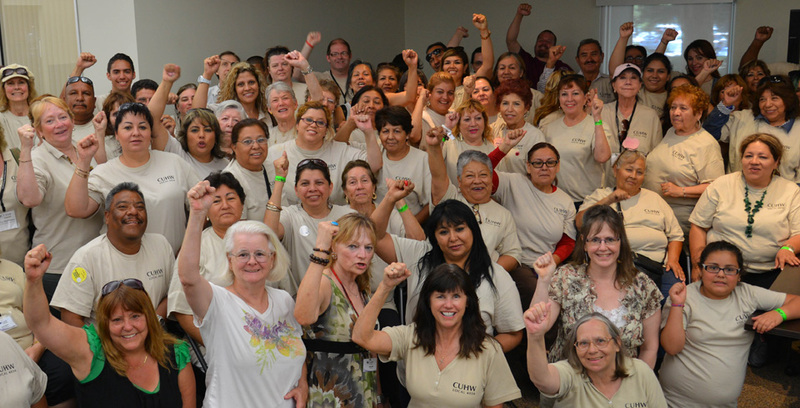 CUHW is a statewide labor organization representing over 20,000 home care workers within California’s IHSS program in 25 counties. This was made by one of our Fair Wage Folks in 2012. The Cafe is family-friendly, community building, relaxing, and fun event. All free! A large buffet of delicious, nutritious food and sweets with coffee, tea, and juice; fabulous live local music; games for kids (plus a playground and a large grassy area for running around); guest speakers; space for informational tables about your projects or organizations; ways to help raise the minimum wage; and an open setting where you can be social or just eat, listen to the music, read the materials, relax. We have lots of handbills for the Cafe if you want a stack to pass out. Great live local music will include Sarah Torres, BeThIsBell, Charlie Sussman, Tommie Willson, and the Mad River Rounders!! Guest speakers will include Natalie Arroyo and Kim Bergel who are running for Eureka City Council and who strongly support the Fair Wage Act, Measure R! Strong wages help build strong families! Gatherings build strong communities! We dedicate this Fair Wage Cafe to Bill Holmes, who passed on August 30th. Bill was one of the Fair Wage Act creators, a talented troubadour and human rights activist, and a good friend to us and to all people struggling with poverty, bad healthcare, trauma, homelessness, or low wages. It was Bill’s idea to have these wonderful Cafes! FIFTY FOUR days until the election on November 4th! Thank you for reading the whole update below. Check out these two new videos (motion graphics) for Measure R! Please watch and spread around. They are identical, except for the endings. Each is less than two minutes long! Please choose one and send it to your Eureka contacts, share on your social media, tweet about them, ‘like’ them on your you tube channel! The Fair Wage Folks at Humboldt Pride festival, Sept. 13! 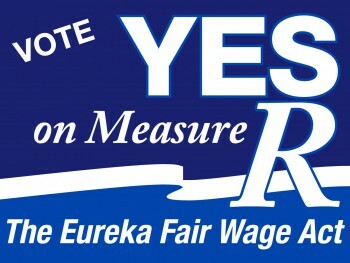 We will have a table set up about the Eureka Fair Wage Act / Measure R all day at the Pride festival. Dedicated Fair Wage folk, Sarah Torres, with her amazing voice and guitar skills, will perform her original songs on stage with BeTHIsBell. It will be a collaboration not to be missed! Both Sarah and Beth have consistently shared their music at the Fair Wage Cafes, Arts Alive, and many street concerts in support of the Fair Wage Act. ARE YOU AND YOUR FRIENDS REGISTERED TO VOTE? Only 54 days until the election on November 4th! If you need to register or know people who do, please call or email us. 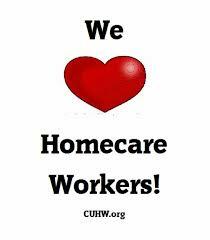 (707) 442-7465, info@fairwages.org We will bring you a registration form. It only takes a couple of minutes to fill out. We all can win this if we vote for higher wages. We also have laminated window signs for your home, office, or vehicle. 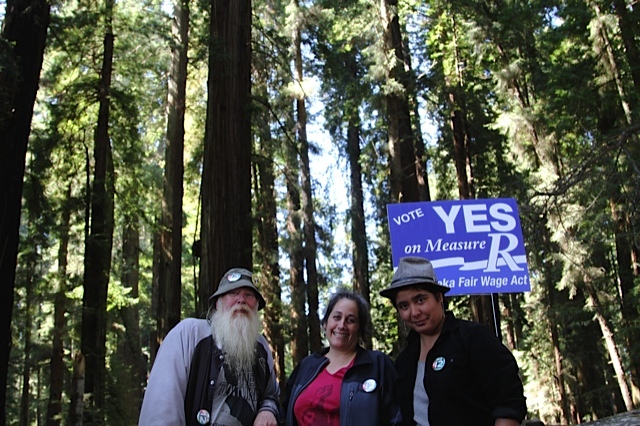 VOLUNTEER Volunteer any evening to help pass Measure R.
Stand with the Fair Wage banner! We have a beautiful YES ON R banner that we can display every day to thousands of passers-by on Broadway. Don, one of the drafters of the Fair Wage Act (Measure R) and a proud Fair Wage Folk, needs one person every weekday to accompany him in sitting or standing with the banner at Wabash and Broadway. Please contact us if you would be willing to hold the professionally made banner (donated by Jim Signs) for two hours with Don. Don will provide transportation to and from the spot on Broadway. Guaranteed laughs with Don, too! Write a letter to the editor in support of Measure R. It would be good to see one every day in the Times-Standard and North Coast Journal. A letter does not need to be complicated- could simply say why you support Measure R.
The community of SeaTac, Washington, home to the Seattle-Tacoma International Airport, this year became the first in the nation to approve a $15 minimum wage law. It’s been more than eight months since the policy took effect, and Dana Milbank highlighted the results over the weekend. As fast-food workers demonstrate nationwide for a $15 hourly wage, and congressional Republicans fight off a $10 federal minimum, little SeaTac has something to offer the debate. Its neighbor, Seattle, was the first big city to approve a $15 wage, this spring, but that doesn’t start phasing in until next year. SeaTac did it all at once. And, though there’s nothing definitive, this much is clear: The sky did not fall. In fairness, SeaTac is a small community and the number of affected workers is quite modest, making this a difficult test case. Still, as Milbank’s piece noted, the owner of a SeaTac hotel, who had strongly opposed the minimum-wage increase during the 2013 debate, said the hike would invariably lead to local layoffs and eliminated jobs. That was last year. This year, with the $15 minimum wage in effect, the hotel is moving forward with a multi-million dollar expansion anyway. And what of Seattle, which will soon have easily the highest minimum wage of any major U.S. city? Milbank’s column added these valuable insights. In Seattle last week, I stopped in at the jammed Palace Kitchen, flagship of Seattle restaurateur Tom Douglas, who runs upward of 15 establishments. He warned in April that the $15 wage could “be the most serious threat to our ability to compete,” and he predicted that “we would lose maybe a quarter of the restaurants in town.” Yet Douglas has opened, or announced, five new restaurants this year. Likewise, the International Franchise Association has sued to block implementation of the law, arguing that nobody “in their right mind” would become a franchisee in Seattle. Yet Togo’s sandwiches, a franchise chain, is expanding into Seattle, saying the $15 wage isn’t a deterrent. And a spokesman for Weyerhaeuser, the venerable wood and paper company, says the $15 wage didn’t factor into its decision, announced last month, to move its headquarters and 800 employees to Seattle from outside Tacoma. It’s against this backdrop that the political debate continues to unfold. The White House made a minimum-wage increase the subject of its official weekly address over the weekend, and just last week, two Republican opponents of a wage hike – Senate Minority Leader Mitch McConnell and Senate hopeful Rep. Tom Cotton – both started hedging on whether an increase is a good idea. “Poverty level wages are not a gamble, they’re a guaranteed loss for the community” — Working Families Party. Working people are ripped off by misguided public policy which claims that giving more money to the already-wealthy creates jobs. This policy fails us because it is based on a lie. When government fails to meet the community’s needs, the people come together to craft a solution. The solution to poverty level wages is to raise them. 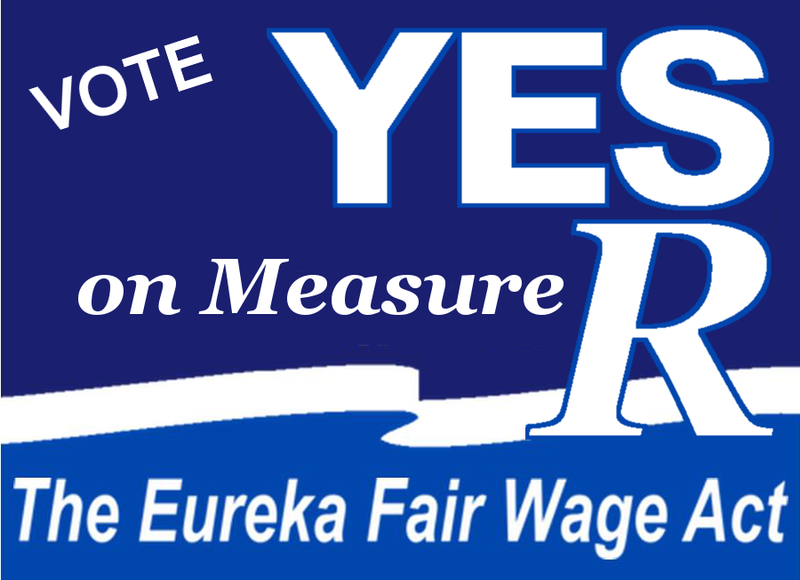 Measure R, the Eureka Fair Wage Act, does just that. Larger employers will pay their workers a minimum of $12 an hour. Smaller businesses, those with 24 or fewer employees, can continue to pay the current state minimum of $9 an hour if they chose. We have over seven decades of data about what happens when we raise the minimum wage. Employment and economic activity go up. Opportunities increase for everyone. In 2012, for example, San Jose residents raised the minimum wage for all workers $2 more an hour. Throughout the first year, unemployment dropped two points and 9,000 new businesses opened. Surrounding communities, including Sunnyvale, Mountain View, Berkeley, and Richmond, are raising wages to keep pace with the competitive, high-wage oasis that is San Jose. Some believe that workers should be paid poverty wages for doing jobs of “unskilled labor,” even if their labor and time generate millions for their employers. First, there is no such thing as unskilled labor. Every person brings the skills of life experience, social interaction, and personal education to every task. “When someone works for less pay than she can live on — when, for example, she goes hungry so that you can eat more cheaply and conveniently — then she has made a great sacrifice for you, she has made you a gift of some part of her abilities, her health, and her life. The ‘working poor,’ as they are approvingly termed, are in fact the major philanthropists of our society. They neglect their own children so that the children of others will be cared for; they live in substandard housing so that other homes will be shiny and perfect; they endure privation so that inflation will be low and stock prices high. To be a member of the working poor is to be an anonymous donor, a nameless benefactor, to everyone else.” — author Barbara Eherenreich. The minimum wage was designed in 1938 — to alleviate poverty. Today, the minimum wage has lost so much buying power that families working full-time struggle to survive. When low-wage workers are paid more fairly, they will earn enough to live independent lives. They can save for their future and that of their children. State and federal minimum wage increases are NOT indexed to inflation. Measure R is. If prices go up, wages will keep pace. Since 1975, people receiving “fixed income” benefits have had yearly cost-of-living increases tied to the Consumer Price Index. Before 1975, they had to wait around until Congress decided it was time for an arbitrary increase. This is still the reality for minimum wage workers in this country. If you’re going to call anything a “fixed income,” let the historical record show that it is the wage of the low-paid worker. We are no longer waiting for legislators to address economic realities. Measure R will result in a fair wage that’s finally indexed to inflation. The cost of living is always rising, and that is not a reason to keep your neighbors living in poverty. Low-wage workers spend their money here at home. Measure R means people can meet their needs and afford leisure activities: go out to dinner and a movie; listen to live local bands with a beverage down at Siren’s Song; take their children to the bouncy house at Bayshore Mall. More money circulating through the hands of local workers, then passing through local businesses rather than corporate headquarters, is vital to rejuvenate Eureka’s economy. Measure R is the right thing to do morally. Being paid a fair wage for your labor is what gives dignity to work. Measure R is the right thing to do fiscally. We live in a demand-driven economy; you can’t drive demand on poverty-level wages. 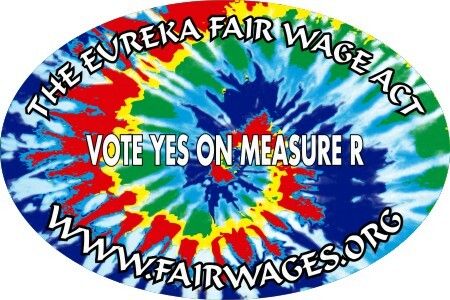 We need Measure R, the Eureka Fair Wage Act. Demand Measure R.
Verbena Lea, one of the drafters of Measure R, resides in Eureka and submitted this “My Word” on behalf of the Fair Wage Folks, a committee of Measure R’s drafters and supporters. The Fair Wage Folks will be there!! We’ll have Measure R yard signs for you to take home. Come to Sequoia Park for for an hour or two for the Labor Day picnic. Measure R YARD SIGNS Available! Call or email us if you would like one to display on your fence, lawn, etc. We’ll bring it to you. Just tell us where to go! YES on R for Fair Wages!! The passage of the Measure R, the Eureka Fair Wage Act, is essential to the future economic vitality of Eureka and this entire region. Measure R, the Eureka Fair Wage Act, will raise the minimum wage. 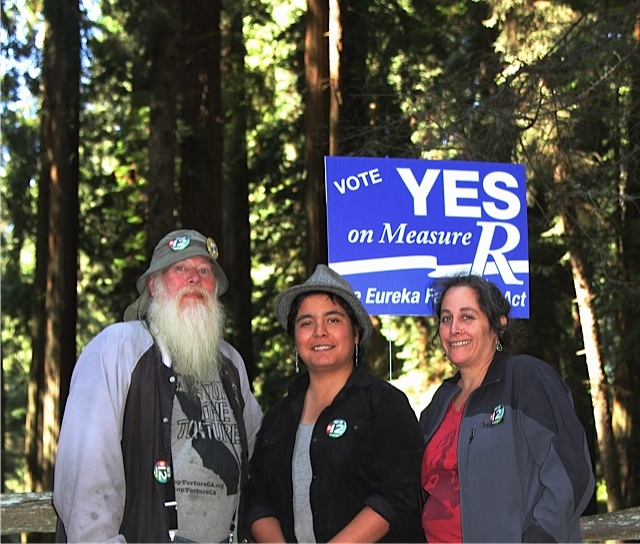 Measure R is legally robust, is tailored to the needs of Eureka, and raising wages is a proven way to increase employment, build a strong and healthy economy, and benefit the lives of working people and their families. The Fair Wage Folks will be canvassing Sunday July 27th. Please join us! At 4:00pm, we will meet at the Eureka Labor Temple (840 E Street, where 9th and E meet). We will do some rehearsing and preparation (so don’t worry if you have never gone door-to-door), then hit the streets within about an hour. We will canvass no later than 8:15pm. We are knocking on peoples’ doors to make sure they know about the Eureka Fair Wage Act, Measure R on the November ballot, and that they are registered to vote in Eureka! And will vote! Call (707) 442-7465 or email info@fairwages.org if you want more info about Sunday (and future) canvassing. Beginning in August, there will be opportunities and NEED to canvass every day/evening! Please get in contact if you are interested in helping out. We need you! Let’s get out the vote and raise wages! You do not have to be a Eureka resident to help canvass. In 6 hours of canvassing, a few of us registered 20 new Eureka City voters! 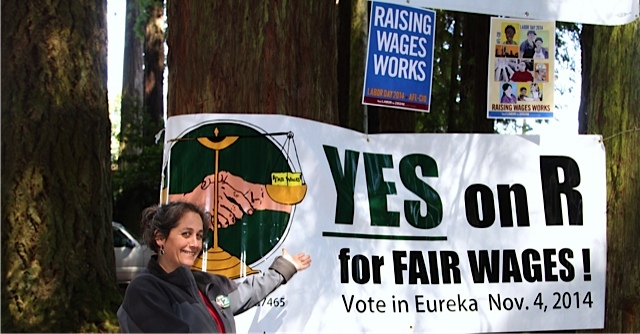 Hundreds of new voters can raise wages and change the political & social landscape of Eureka for the better. -be a visible where people can come in to LEARN AND TALK ABOUT MEASURE R, the Eureka Fair Wage Act. 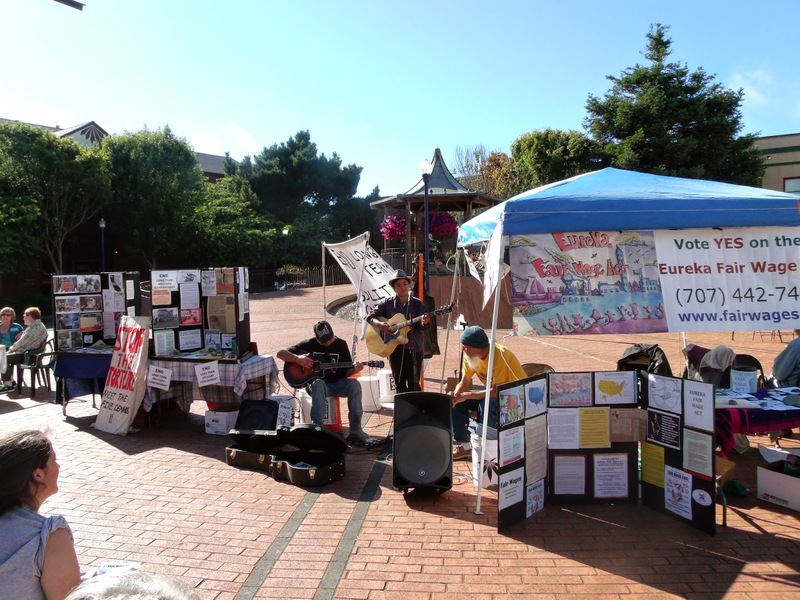 *We are very grateful to have the use PARC (Peoples’ Action for Rights and Community) and the Eureka Labor Temple for our meetings, canvass training, and Fair Wage Cafes. 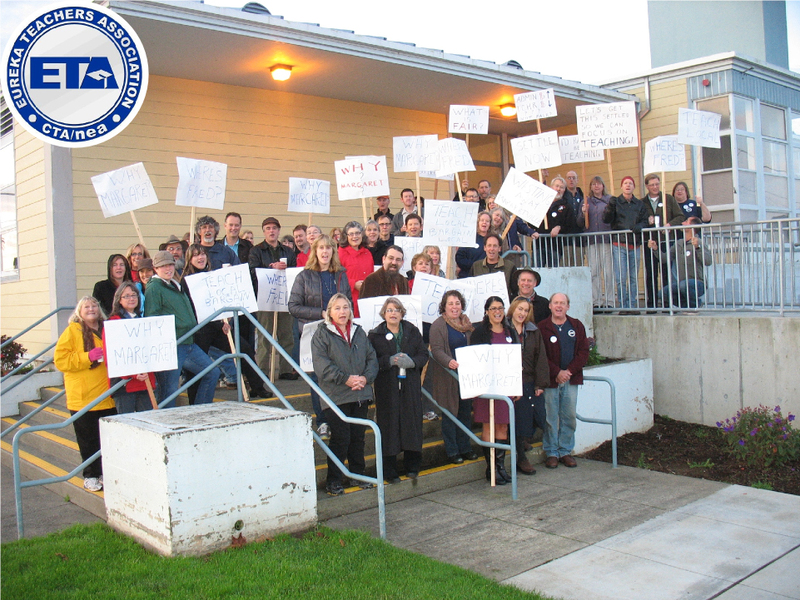 We drafted the Eureka Fair Wage Act at the Labor Temple! Our desire for a campaign headquarters comes from our need for an equipped office and dedicated organizing space that we can use every day until we win the election on November 4, 2014. Our weekly meeting Tues we will be upstairs or in the basement. on Sunday, July 13 at 2 PM. Supervisor Candidate and former Eureka City Council Member Chris Kerrigan will be making a short speech at our Fair Wage Café. Chris will speak at 3 pm. Hammond Park 14th and E, Eureka. Free food, free music from noon til five pm! 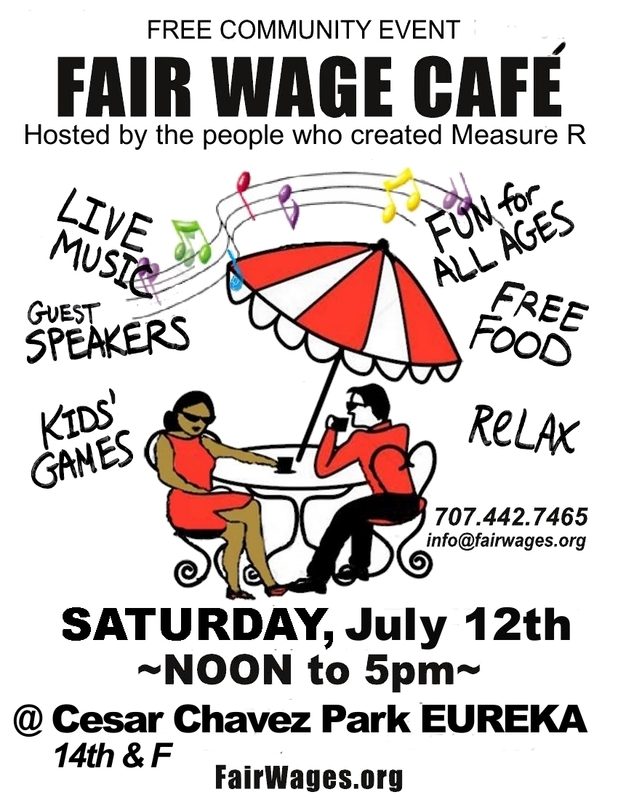 Fair Wage Cafe in the Park July 12! 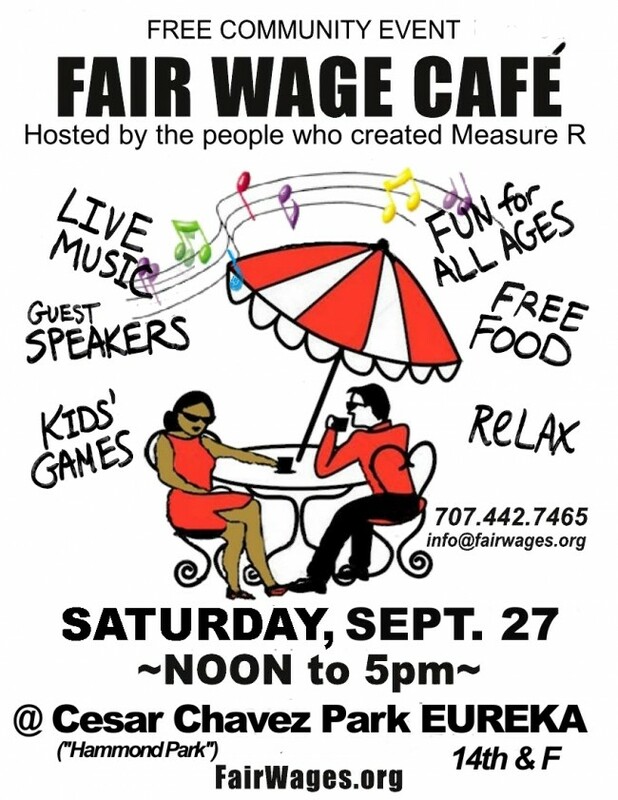 Fair Wage Cafe- Awesome Community Event! Bring family and friends for fabulous live local music all day, coffee, tea, juice, games for kids, lunch, and snacks. All Free! The cafe is a family-friendly space. Will include music from Sarah Torres, Pocketfulofposies , Mad River Rounders, Jesse Augustine Walker, Rob Brundage, and Lisa Sharry. Also, hear from a local who has been working to unionize at his Eureka workplace, facing opposition from “higher ups.”. People/Organizations are welcome to set up informational tables. Tables provided. This is the 10th Fair Wage Cafe!! Hosted by the folks who wrote Measure R, the Eureka Fair Wage Act, which is on the Nov. 2014 ballot! Strong wages help build strong families! Gatherings build strong communities! See you Saturday! We put on Another Full Day of music and education out in front of the Gazebo. Thanks to Jessie and Robert and Turtle and Guitar Dan an Sarah Torres and Electric Bill for providing the Music. All local musicians that give of their talents to help improve the community, thank you. Thank you also to the people that helped table and register voters and just hung out and talked. It was a long weekend but a fun one. “And they were wrong!” Those are the words of Professor Scott Meyers-Lipton of San Jose State University when talking about the gloom and doom forecasts by opponents of Measure D, which raised the minimum wage for the City of San Jose. One year since San Jose residents passed Measure D, raising the minimum wage, employment is up, more businesses have been created, existing businesses thrive (including restaurants), and work hours remain the same. Here, the Eureka Chamber of Commerce doom and gloom response to the Eureka Fair Wage Act perpetrates the same old lie- that paying workers fairly kills jobs. The facts prove the Chamber’s statement to be nothing more than fear mongering. The Eureka Chamber of Commerce is just flat out wrong, as it raises the same old tired objections that were erroneously made about San Jose’s successful Measure D.
In California, higher minimum wage initiatives have passed whenever put to a vote of the people. The economies of those higher wage communities have done consistently better then their lower wage neighbors. This trend is also seen throughout the country. It is a shame that the Eureka Chamber failed to do any research. We could have provided the Chamber with the data from cities including San Jose,California and Santa Fe, New Mexico so it could make an informed decision and understand that Eureka will thrive with higher wages. Many studies showing the positive, indisputable effects of raising the minimum wage are linked on our website, fairwages.org. The business and labor playing fields are not level now. 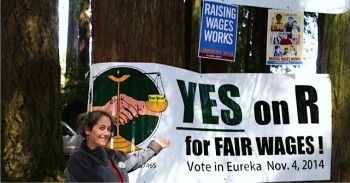 The Eureka Fair Wage Act will help to make things more level, that’s right, fair. Huge corporations like Walmart and Target use slave labor in China, abusing millions of workers abroad and crushing local competition here in the U.S. Look at all the empty store fronts they have created in Eureka. The empirical data all show that measures raising the minimum wage boost local business and strengthen local economies. It is a shame that the Eureka Chamber of Commerce, an entity supported by local tax dollars, is shilling for out-of-town corporations and acting against the peoples’ well-being- with no regard for the facts.